Running children's classes is complicated. Sawyer Tools exists to make it simple. Built by and for kids activity providers. Sawyer Tools saves educators time and money. Not to mention: their sanity. 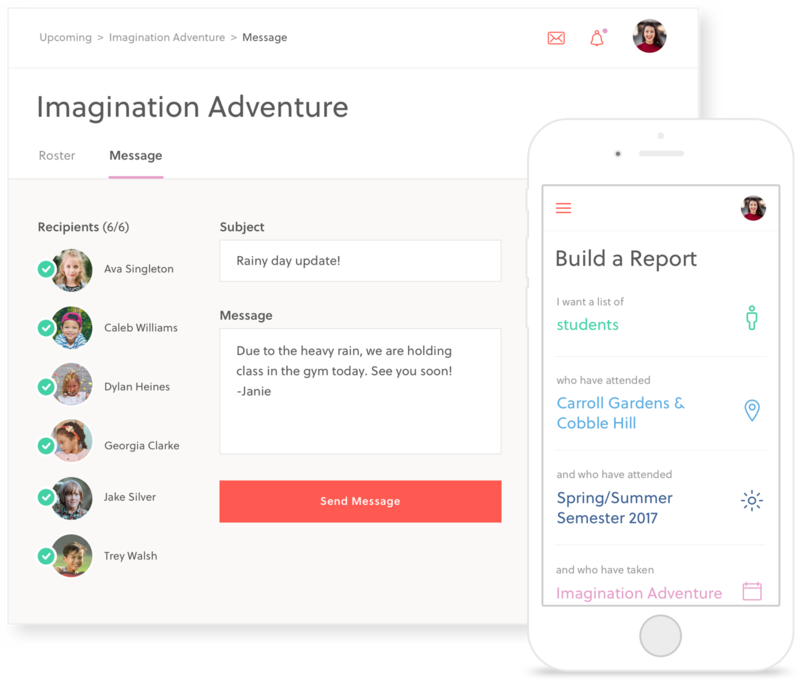 Our class management software makes it easy to customize everything from soccer camps to science semesters. 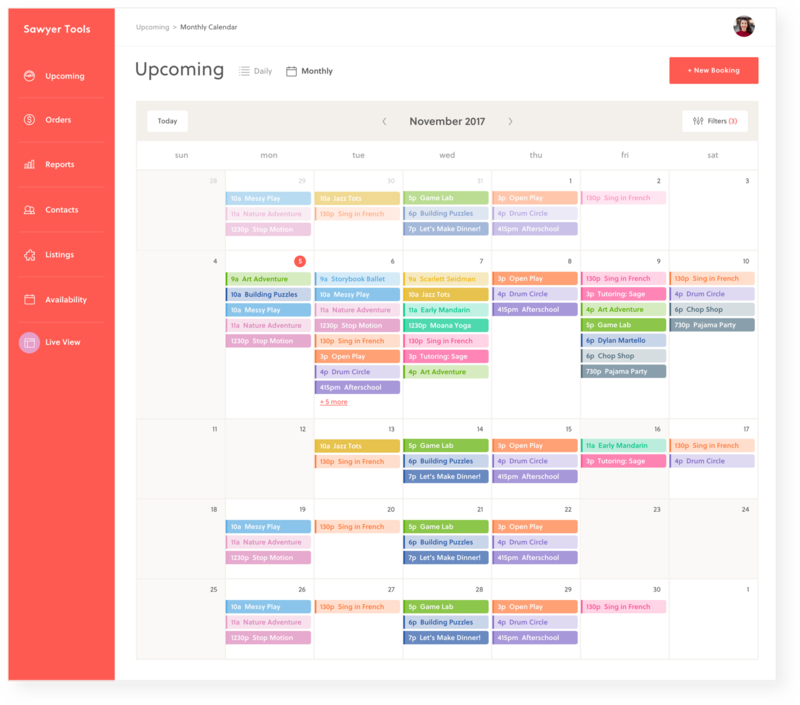 One-size scheduling doesn't fit all. Sawyer Tools accommodates varied offerings, flexible pricing and holiday adjustments. So, if you have a 1 hour private lesson at one price or a special workshop at another price, it's simple to set up. Whether it's class packs, payment plans, sibling discounts or coupons, we welcome more ways to pay. Plus, Sawyer Tools accepts it all: credit cards, secure online payments, automated recurring payments and even cash. Friendly filters make tracking revenue, attendance, referrals or retention a breeze. With the right information at your fingertips, you can get an instant snapshot of how your business is performing. If you're in class or in Hawaii, you can still build new reports or open existing ones. Camp starts in an hour and you need a list of all campers with a nut allergy? Easy. Instructor needs a sub? Swap them out instantly no matter where you are. Then share rosters and class notes, from allergy information to lesson plans in a snap. Whether it's first-day details, last-minute changes or holiday reminders, you can easily keep everyone on the same page. Message one family, one class or all of your clients at once. Give parents the assurance that comes with booking classes on your site. Our custom registration widget embeds easily, seamlessly fits into your look and feel, and ensures secure payments. Bonus: No more checks! Let parents view real-time availability, set up their child's profile, and save some trees by submitting custom forms online — at any time, on any device. Allow happy parents to advocate for you by rating their experiences online after class, giving you opportunities to improve and double down on what's working. You've made the work of a solo business owner so much easier. I feel like I'm part of a team. to hand out flyers on a scooter. I don't have to do that anymore. provides that flexibility to us. You've made the work of a solo business owner so much easier. I feel like I'm part of a team. I'm growing with Sawyer — I used to hand out flyers on a scooter. I don't have to do that anymore.